Travellers often overlook spending one day in Madrid in favour of the unique architecture of Barcelona or the beaches of San Sebastian. If you skip out on the Spanish capital though, you’re missing out on a huge dose of incredible food, culture, shopping, and history. The capital city of Spain has a lot to offer. It’s home to large, carefully manicured parks and world-renowned museums. You’ll also find open-air cafes infused with the delectable aroma of freshly brewed coffee. It’s a quintessential European city; you can easily spend one full day exploring Madrid and be left screaming for more. How can you plan a Madrid itinerary when you’ve got so many options to choose from? Madrid has endless activities, landmarks, and attractions to keep you busy for days. Even after spending an entire week in the city, you may not see it all (as we warn with most of our city itineraries). 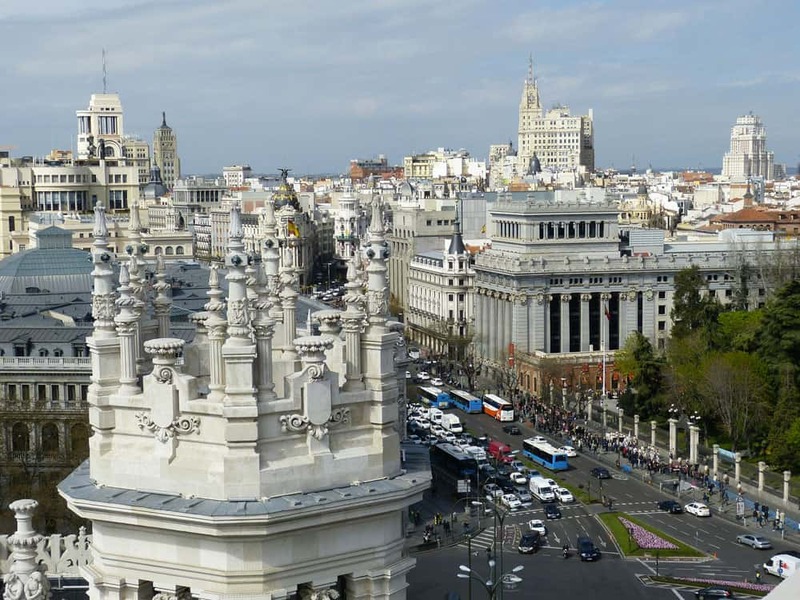 Luckily, Madrid is a walkable city, and you can hit quite a few attractions in a single day. Use the following itinerary for the perfect 24 hours in Madrid. You’ll begin with a traditional Madrid breakfast before enjoying a busy day filled with trips to historic sites, the best cafes, and plenty of tapas. Preparing for your Madrid itinerary? Don’t forget to protect yourself with travel insurance! One of the top attractions in Madrid is in the heart of the city. 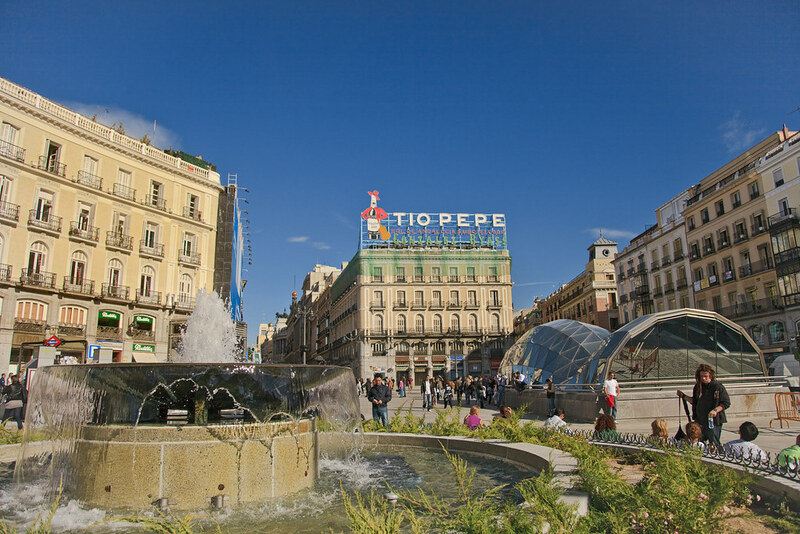 Puerta del Sol is a large public square and the busiest spot in the capital, which is why you’re starting your day there. You’ll beat the crowds as you explore the city centre in the morning. From this spot, a network of roads branches out across the city. When you reach the centre, turn south. You’ll see a large clock tower. Each New Year’s Eve, millions of Spaniards tune in to watch as the clock chimes twelve times to ring in the near year. It’s Spain’s equivalent of the Times Square Ball Drop. You could really spend all day in this central area. You’re surrounded by shops, restaurants, and museums. If you want to see more of the city, you’ll need to branch out on one of the side roads and head toward the Royal Palace. Walk west on Calle del Arenal. It’s one of the smaller roads heading west from the city centre. On your way to the Royal Palace, you’ll need to grab something to eat. A chocolate-dipped churro is a great way to start the day. Two blocks along Calle del Arenal, turn left on Pasadizo de San Gines. 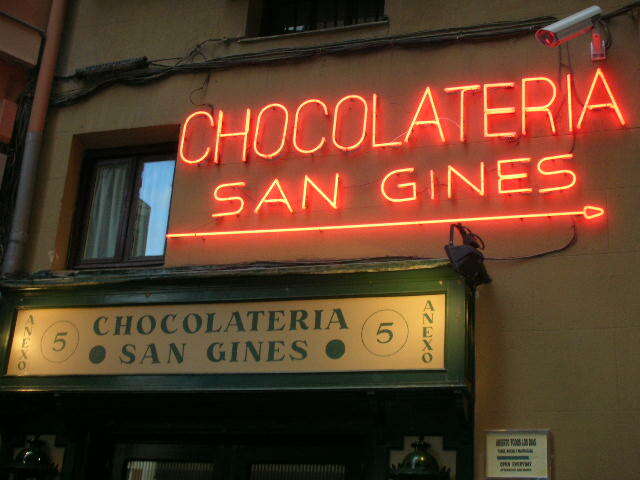 A couple of buildings down the street you’ll find Chocolateria San Gines. The spot also known as Chocolate Café serves fresh churros served with thick hot chocolate for dipping. Churros are long, thin fried dough and a staple of the region. When your stomach is full, continue your trek to the Royal Palace. 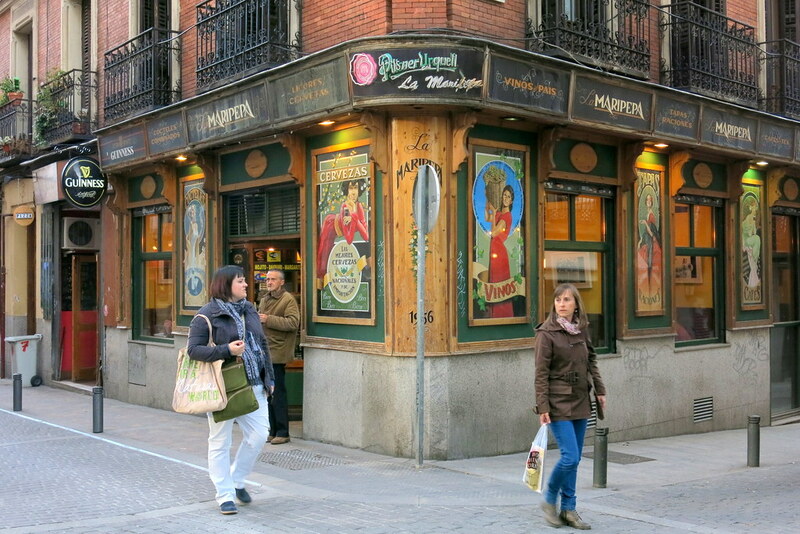 Head south and turn right on Calle Mayor – it’s the first street that you’ll come to after leaving the café. If the churro doesn’t fill you up or you need some extra caffeine, you’ll pass at least a dozen more cafes during the ten-minute walk to the Royal Palace. Calle Mayor takes you directly to the courtyard surrounding the Royal Palace. It was built in the 18th century and is still used for state ceremonies. 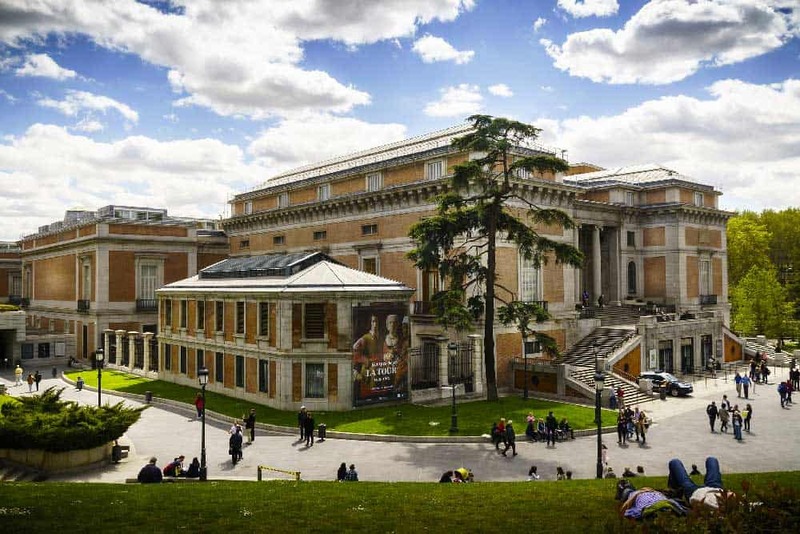 It is also open to the public and one of the top attractions in Madrid. When you get inside, you can either purchase a normal ticket or take a guided tour. You’ve got time for the guided tour if you want to learn more about the history of Madrid and the Royal Family. The normal ticket is also fun, as you can explore at your own pace. You can check out the banquet rooms, residential areas, and throne room on your own, but you’ll miss out on the history lessons. Your next destination is just outside the Palace. The Sabatini gardens are part of the Palace and located on the north side. It is open all day, and you don’t need to buy another ticket. The first thing that you’ll notice is that the gardens are not very big. It’s a small spot with carefully manicured lawns and topiaries. It’s also the perfect spot for a late morning break before you continue your journey. You get a great view of the northern façade of the Palace, and can rest your legs for a few minutes. 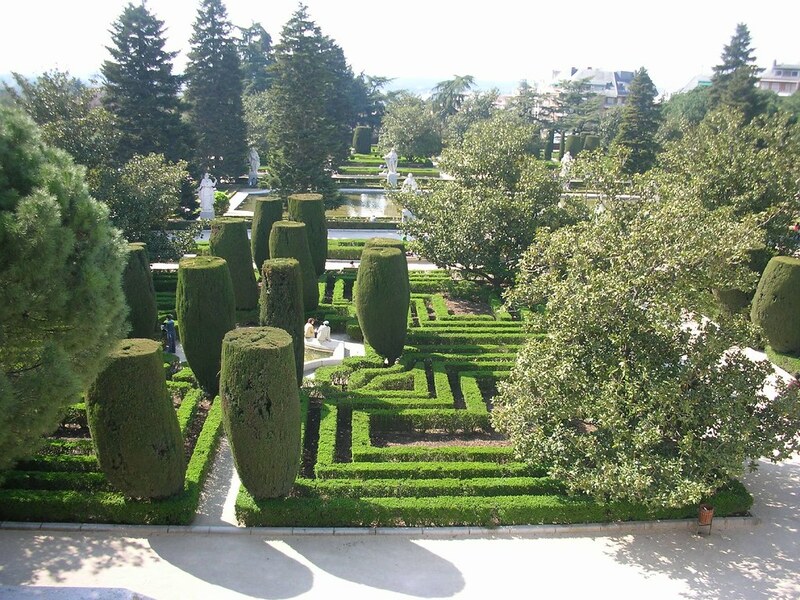 Besides topiaries, the gardens have a few statues of Spanish kings and a hedge maze. If the area isn’t too crowded, take a quick trip through the maze and then leave the Palace grounds. After the Royal Gardens, it’s time to see the Royal Theatre. It’s directly to the east and impossible to miss. When you leave the Palace courtyard, cut through Plaza de Oriente. Plaza de Oriente is another landmark, but there is not much to do except pass through it. Designed in 1844 by Narciso Pascual y Colomer, It features a large monument surrounded by raised stone garden beds and ledges. 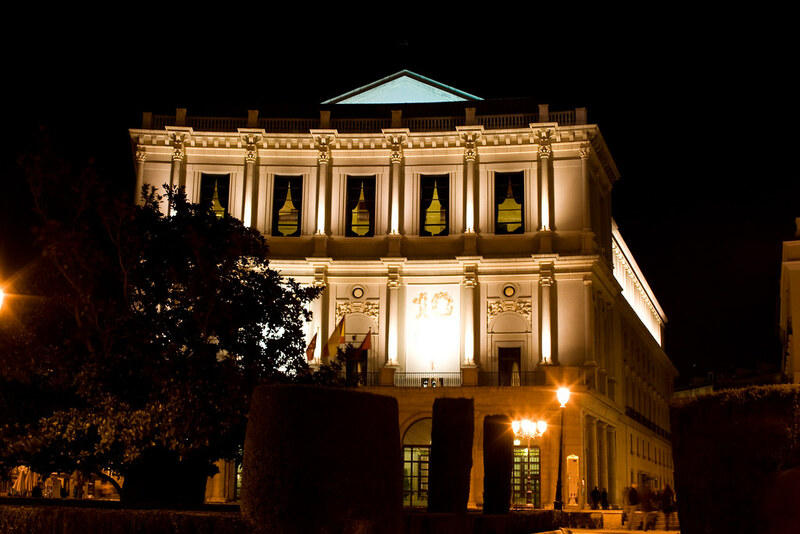 It also provides another great view of the Palace and the Teatro Real (“Royal Theatre”). The opera house was built in 1818 by King Ferdinand VII and still hosts operatic performances more than 200 years later. Major productions are held throughout the year. They also offer guided tours. The tours are offered throughout the day and typically last about 50 to 90 minutes, depending on whether you take the art tour or the technical tour. You get to check out the rehearsal rooms, step on the stage, and view the Royal Box. If you’re visiting during a busy tourist season, save time by buying your tickets for the tour online. This will allow you to quickly enter without having to line up. Once you leave the opera house, start walking south. Your destination is San Miguel Market, and it’s located just on the other side of Calle Mayor. It’s a large covered market that mostly serves tapas. Tapas are appetizers commonly served at bars and restaurants. They’re typically paired with a beer or cocktail. You may want to skip the stronger beverages until you’re closer to the end of the one-day tour. You’ve still got a lot more walking to do and plenty of time for cocktails! The market houses over 30 different stands. 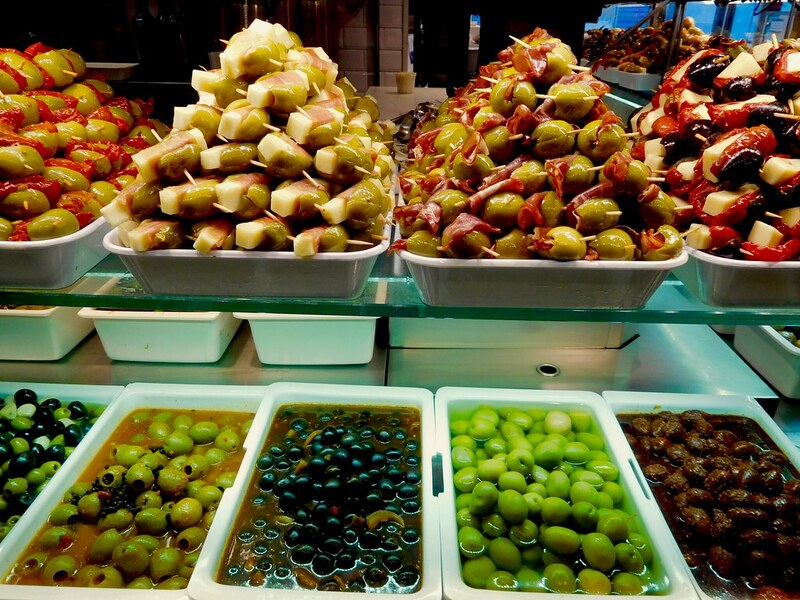 While tapas are the specialty, you’ll find cuisine from all corners of Spain. You can get seafood, specialty cheeses, and the best ham that you’ve ever tried. It’s also one of the most popular attractions in Madrid, bringing in millions of visitors each year. By the time you reach the market, it should be crowded. Try to choose a stand with the shortest line, and get some food before walking to the next attraction. If the lines at the market are too long, you may have better luck finding some food at the Plaza Mayor. You can get to the Plaza Mayor by walking directly east from San Miguel Market. Instead of walking back up to Calle Mayor, cut through Calle de Cdad. This small side street offers a different view of the city compared to the large avenue. 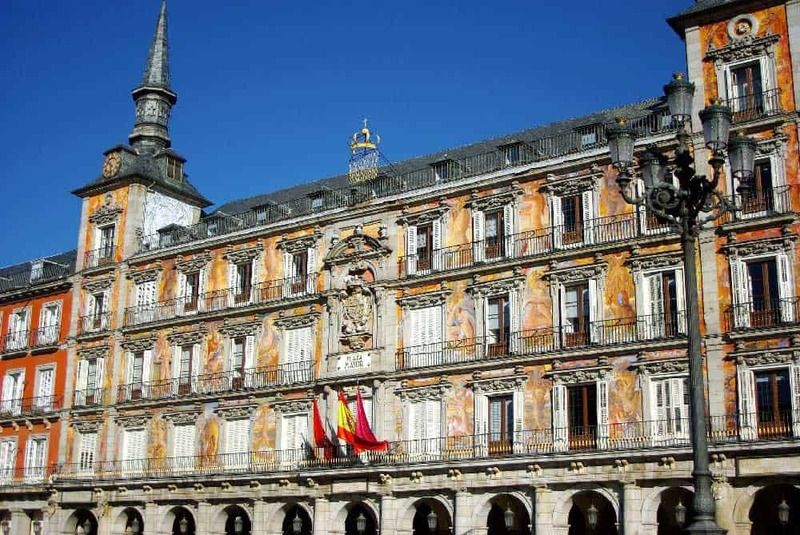 Like most of the attractions in Madrid, you cannot miss the Plaza Mayor. The “main square” was the centre of Old Madrid. It’s now one of the main market areas in the city. The main square features a large open courtyard surrounded by buildings housing various shops, cafes, and restaurants. This is a good opportunity to do some shopping if you want to pick up some souvenirs or get some more food. When you’re done walking around the main square, start walking east toward Prado Museum. This famous art museum is the main national art museum in Spain and considered to have the finest collection of European art in the world. You can view works by El Greco, Rubens, Goya, and Diego Velazquez. There are thousands of drawings, paintings, prints, and sculptures. You could spend all day marvelling the creative genius behind these works or you can take another guided tour to round out your educational trip. Along with the Prado, the Thyssen-Bornemisza and the Reina Sofia Museums are called the Golden Triangle of Art. If you happened to make good time, you could consider visiting these other museums as well. After touring one or more of Madrid’s finest museums, you’re likely building up an appetite. Luckily, the neighbourhood that you’ve spent your day walking around is full of great spots to grab a bite. You can hardly turn a corner without seeing a restaurant, bar, or café. There are luxury dining options that require reservations and crowded karaoke bars with music spilling out into the streets. Bar hopping is one of the best things to do in Madrid, even if you don’t like to drink. On the weekends, the neighbourhood boasts world-class nightlife. Walk into the first bar that you come across and order tapas and a drink. When you’re done, walk to the next place that catches your attention and try some more tapas. Fill up on a few appetizers and continue to explore the Centro neighbourhood until you’re ready to retire and wrap up your day in Madrid. Even with its sprawling size, choosing where to stay in Madrid isn’t such a big task for travellers. Most of the city’s top attractions lie within the Centro, making it an obvious choice to become your base for your layover in Madrid. 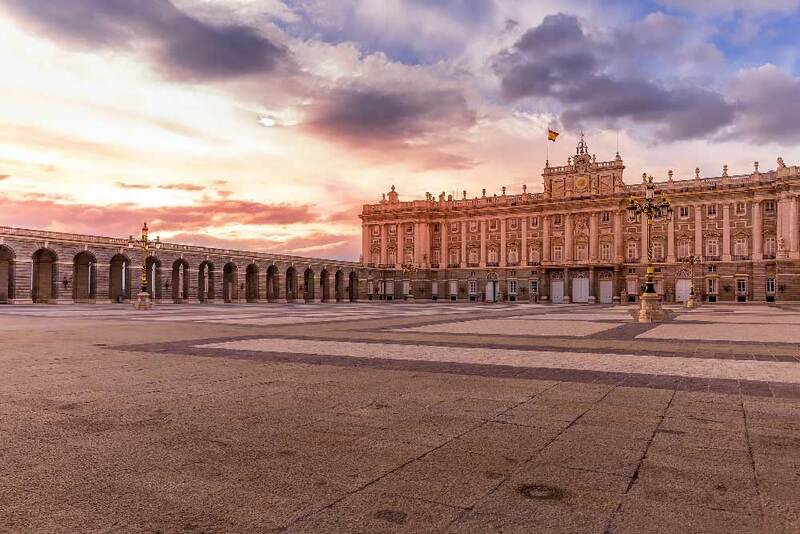 Hostal Central Palace Madrid: One of the most budget-friendly picks in the city, this central hotel offers spacious rooms in a lovely property that overlooks the Royal Palace and Sabatini Gardens. Catalonia Las Cortes: Anyone looking to throw a little class into their Madrid itinerary will love this mid-range hotel set in an elegant 18th-century building. Rooms range between modern & classic motifs with their superior suites offering a regal glimpse into earlier European history. VP Plaza España Design: One of the best luxury hotels in the city, the 5-star accommodations here are stylish & contemporary with plenty of space and incredible views of the city. From the wellness centre & seasonal pool to the on-site restaurant & sky bar, the amenities at this hotel are also top notch.